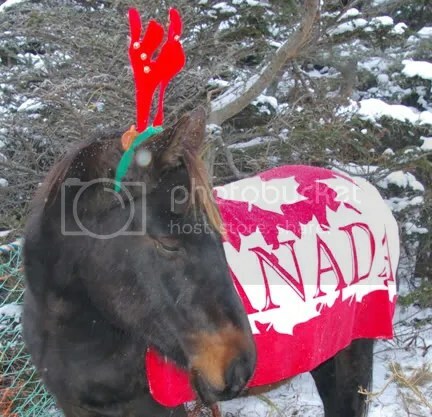 The Canadian Horse – My Canadian Horse! The Canadian Horse is a little known national treasure of the country, because it was rare for someone to write about the breed. This breed has descended from royal horses, originally sent to the “New World” by King Louis XIV of France in the mid 1600’s. The Norman and Breton horses were thought to have had Arabain, Andalusian and Barb ancestry, all traits of which are still recognized in the Canadian Horse. These horses were distributed among the military officers of the Carignan-Salieres regiment, government officials and the religious communities of new colony. For centuries the French horses bred with little influence from outside breeds. Indeed, they developed into their own distinct breed, which originally was called the “French Canadian Horse”, but has long lost that name. This horse evolved under adverse conditions of harsh weather, scarce food, and hard work and it remains the sturdiest, most acclimatized horse in Canadian history. They are tough, strong horses, tolerant of inclement weather conditions, and are extremely “easy keepers”. Because of these traits, the Canadian Horse is often referred to as “The Little Iron Horse”. In the 1800’s around 150,000 of the animals were known to exist. The breed was used for cross-breeding to improve strength and hardiness in other breeds and aided in the founding of breeds such as the Morgan, Tennessee Walking Horse, the Standardbred and the American Saddlebred. The number began to dwindle rapidly when the horse was exported for wars and work in dangerous situations. The Canadian Horse was near extinction with the advent of mechanized farm machinery. By the late 1870’s the peril of the breed was finally recognized and efforts were made by diligent breeders to bring the Canadian Horse back from the verge of extinction. In 1888, the first stud book was created to try and preserve the breed. Down to a count of 400 horses worldwide and only approximately 250 breeding stock in Canada, the breed slowly began to gain in numbers, after the first stud book was presented. However, after more than a century, there are still only 2500 purebreds in existence. The Canadian Horse is classified as “critical” on the American Livestock Conservancy list. On April 30th, 2002, a bill was passed into law by the Canadian Government making the Canadian Horse an official animal symbol of Canada, sharing the title with the beaver. Typically the Canadian stands 14 to 16 hands high and weighs 1000 to 1400 pounds. Most often they are black in color, but have been known to be dark brown, bay or chestnut. They have finely chiseled heads, naturally arching necks and thick, long manes and tails that may or may not be wavy. They have sturdy, strong legs and short cannon bones often exceeding nine inches in circumference. Their hooves are exceptionally well formed, tough and require little more that routine trimming. The Canadian Horse is renown for its kind, sensible, sociable nature, intelligence and willingness to please. Most commonly used for driving, the Canadian Horse is truly one of the most versatile of all breeds and may be found in show classes doing such activities as dressage, jumping, and in event classes. It is known for it’s long endurance, trail-riding, ranch work or just being the family or kid’s horse. Whatever reason a person might want a horse for, a Canadian will fit into that position comfortably. The strength and structure of the back of a horse are critical for the usefulness of the animal. Since a horse is used for a variety of activities, it therefore is necessary for the user of the animal to understand the strengths and weaknesses that can occur with a particular horse. The back is a complex design of bone, muscle, tendons and ligaments that all work together to allow a horse to support the weight of a rider. The shape of a horse’s back can vary from horse to horse, and it can change on an individual horse over the years, as the horse ages. The topline’ of the back is the upper curvature of the withers through the back and to the loin area, whereas the underline’ is the length of belly from the elbow to the flank. Both lines work together, to enable the horse to move flexibly. The abdominal muscles where the underline is, can provide tremendous support to the back when well conditioned. A long underline’ in relation to a shorter topline’ is ideal for riding activities. The average horse can carry up to approximately 25% of its own body weight. This also depends on body structure or the conformation and the physical condition of the horse. In other words, a horse with well-developed abdominal and back muscles, will be able to carry more weight for a longer time, than one that is not in good shape. A roach’ back and a sway’ back are two primary flaws in back conformation. A roach’ back or a straight back on a horse is when there is insufficient curvature of the spine and is not as common as a sway’ back or a normal back. The sway back is when there is too much curvature. Either conformation can be distressful to a horse, but can also be, if not overcome completely, than aided with proper attention. The ideal length of a horse’s back is one third of the entire length of the body. A long backed horse is when the length from the peak of the withers to the point of the hip exceeds a third of the overall body length or from the point of the shoulder to the point of the buttock, excluding the head and neck. Whereas, a short back is less that one third of the body length. An example of a long backed horse might be that of a gaited’ horse, such as an American Saddlebred or a Tennessee Walking Horse, though not all long backs are gaited’. The advantage of riding these types of horses is that the back is flexible, making the back flatter, quieter and an overall smoother ride. The disadvantage is that it is difficult for the horse to round his back up for tight, quick maneuvers. An example of a short back could be but not necessarily is Arabians, Morgans or the American Quarter Horse. The advantage to a short back is that the horse is quick, agile and strong, able to change direction with ease. However, a short back is usually less flexible and could lead to spinal arthritis. In determining the conformation of the back of a horse, a rider can decide if a particular horse will be a suitable mount. It will tell the rider whether or not the horse in question will suffer from exposure to the work determined by that rider. If an animal is showing signs of back pain, a veterinarian experienced in large animal care or an experienced horse owner can palpate the back of a horse to pinpoint sources of pain and from there and assess the most likely cause of the pain, thereby following the proper course of treatment. This is my first post and it is a sad one. Last year I bought four horses. 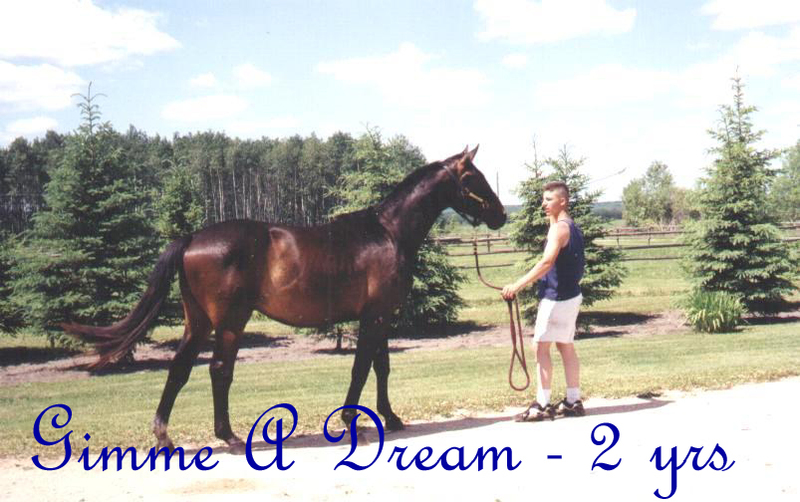 Two of them were almost twin-looking, Standardbred fillies off the race track. One, the youngest was called Sam’s Pride. This is the story of the last couple of days of her life. 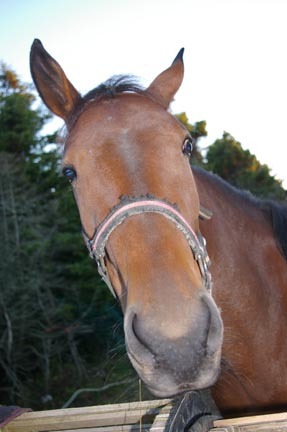 I lost a 2-year-old filly, Sam’s Pride in February 2008, to seizures. I’ve had horses for 45 years and I had never heard of a horse taking seizures before. Apparently, I wasn’t the only one. I had asked the vet about the strange behaviors that this young filly was having and then the horse owners at the local race track, including her previous owner, if they could identify the actions. Mostly the men said “no”, gave me a weird look, like I was exaggerating and said it must be some form of colic. So I agreed with them. If nothing else I learned a lot about colic and I learned that my dear Sammy was never colicky. We live on an island, in the middle of the Gulf of Saint Lawrence. At the end of January, the ice starts to form and fill the Gulf, stopping all ocean going traffic, leaving the islands in isolation for two months. The ferry service resumes around the first of April. The last week in February, at 5:00am, Sammy fell down in her favorite place, in the large greenhouse, next to the house and stayed down. We could hear the disturbance and we went running for the door. Sammy was lying on a very soft area of ground close to an electrical outlet, where I placed heat lamps and kept the temperature in the building warm. I also kept hot water bottles around her, on the hay covered, soft ground and under the two winter horse blankets that she was covered with. Her body temperature had dropped to a level that concerned me and at the suggestion of the veterinarian, I brought her body temperature back to normal levels. Up until this point, I had been using the word ‘convulsion’ to describe some of her strange actions, which would explain severe colic in young horses. When she fell, she had a ‘grand mal’ seizure, but since I had never seen this thrashing about before, I still used the word ‘convulsion’ when describing her strange actions. But I also told people that she was thrashing about, even though it didn’t appear like she was trying to get up. She didn’t seem to have any pain, however she seemed confused and very tired after the thrashing stopped. Thirty hours after she first went down, a group of horse men and I tried to lift her in a sling, set up with a block and tackle. Mostly she refused to help and behaved like a kitten being moved about, in its mother mouth. Still, it was obvious that she had strength and the ability for strong movement, in all four of her legs. I had a second veterinarian in to see her, about an hour after we tried to sling her up and the lady couldn’t find anything to say the horse was even sick. Tests had already been done on her stools and blood. They came back normal earlier in the month. Her temperature was normal as was her heart, lungs, gums, ears, eyes and nose. Her stools were clean and proper, her urine was fine. She was eating, in fact like most horses, she rarely stopped eating, even while the vet examined her. The lady couldn’t find anything wrong with her legs. There were no swellings or cuts on her body, to indicate that the herd had damaged her in any way. I also know this was the case, since the filly stayed with me, because the herd didn’t want her around them. She was a good weight for her age, not too heavy or too thin. The veterinarian gave her a vitamin shot and antibiotics, explaining that they won’t hurt her, but she couldn’t find an infection. She gave me more and explained how and when to give the shots. The veterinarian said that if she didn’t get up on her own within forty-eight hours, then it would be best to put her down. I had asked the veterinarian if she had ever seen anything like this before and she had said no, never in horses. To say she was perplexed would be an understatement. My dear young filly, Sam’s Pride, “Sammy” died of natural causes twelve hours later. Having an autopsy preformed was impossible due to the lack of facilities on the islands and the costs of such a procedure. Then, of course the worry came, that perhaps she had something contagious, something that had been passed on to the other horses. It was a week later, before I realized that she had been having increasingly severe seizures and eventually she went into one and never survived it. Calls to the equine hospital on Prince Edward Island, had finally determined that something had probably blocked the oxygenated blood from her lungs to her brain through the aortic arch. I could never have saved Sammy, I know that now, even if I had been able to get her to the equine hospital. Living on an ice bound island at the end of February, made that impossible. It was likely even with anti-convulsive medication, she would still be a risk around other animals and people. Perhaps she had an operable tumor or a removable blood clot, that caused the seizures. I would have spent all my savings and everything else to save her, but in the end, no matter what, my Sammy had to die. My reasoning is that she could never be trusted, not to take other seizures and therefore had to be kept isolated. That would not have been fair to this young horse. My dear little Sammy had lived a hard life, as an investment at the track and was just learning love and to show love, when she died. She would try to mimic me when I gave her kisses on her neck and face by putting her lips to my cheek and make a sucking sound, much like sucking up water. She also let me know when she needed a hug, something I gave her frequently. When I was near, she would come close, close enough to push me off my feet and wrap her neck and head around my neck and wait for me to wrap my arms around her neck and chest and hold her. She had just learned what love was…. I love my other horses, but the loss of Sammy broke my heart.